I have been on the search for a whole new breakfast menu and I have found something that is easy to make, and what I consider to be healthy. When I first read the recipe I said to myself, ‘This has way too much going on for me” but at the same time it sounded good, so I went for it. I could eat this at least 3-4 times a week. Let me know what you think after you have tried it. PS- I even eat this as a late night snack. 1) Combine chia and hemp seeds in a bowl and pour coconut milk on top to cover seeds. 2) Place covered bowl in the refrigerator overnight or a minimum of 2 hours. 3) In the morning add almond butter and blend with mixer until well blended. 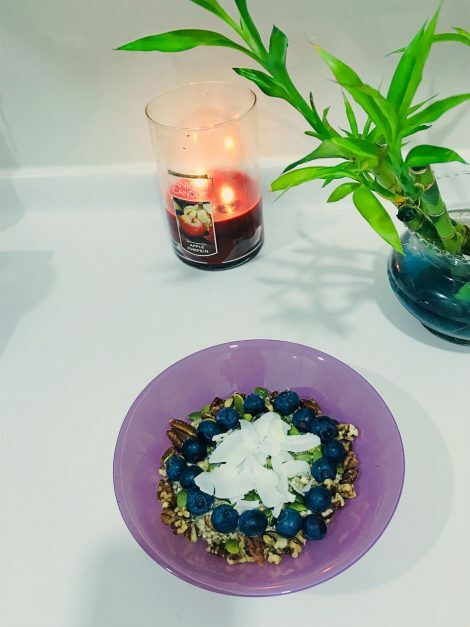 4) Add pumpkin seeds, pecans, coconut flakes, and blueberries to your satisfaction. Enjoy!!! * Step 1 can be done days in advance and will still be safe to eat as long as it remains refrigerated. I hope you enjoy this breakfast bowl just as much as I do. Be sure to subscribe with your email for future recipes and giveaways. Tried the breakfast bowl. It wasn’t too bad. Will definitely try again. I accidentally bought cinnamon peanut butter and that gave it some flavor. Next time I will add more berries. I’m not a fan of peanut butter but cinnamon flavor might make me join the team. I went for original almond butter to cut down my sugar a bit. At times I’ll add a few drops and of sweetener.